This is a picture of a cat fleece hair near the end of the hair. 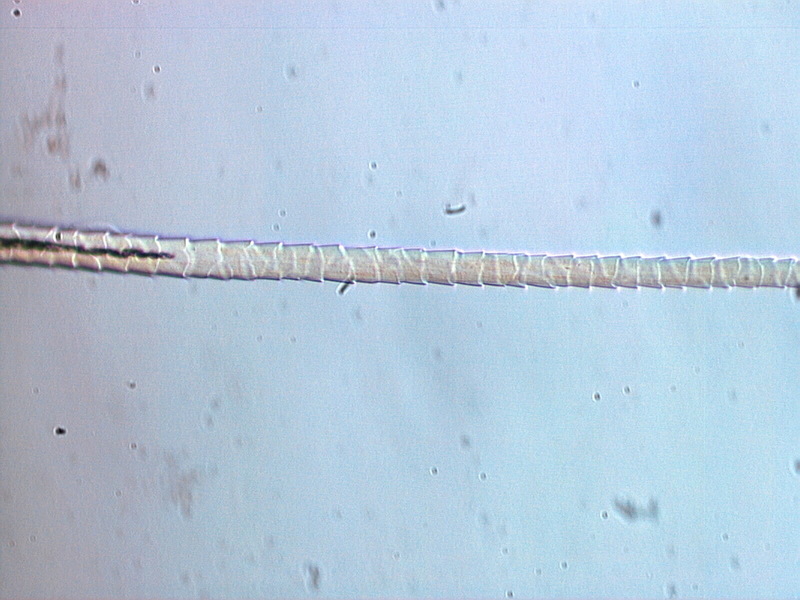 This hair belongs to the group Felis catus, or domestic cat. Cat hair tends to have a relatively wide medulla at mid-shaft but begins in the classic "wine goblet" form near the root and is uniserial in the fleece but becomes more complex in the guard hairs. The pigment bodies are in the cortex. The cuticle tends to be imbricate, toothlike and prominent over the main part of the shaft for both fleece and guard hairs. The root of the hair is elongated with little change in diameter and is often frayed at the base.